Today’s comic book review is not so indie as the last few. It also veers from review to rant a little bit, but whatevsies. With Guardians of the Galaxy poised to take the title of Greatest Movie Ever Made any day now (at least until Age of Ultron comes out… or maybe Star Wars VII… or Pacific Rim 2), I thought I’d take a look at one of Marvel’s crucial movie tie-in’s, intended to drum up excitement and dollars in advance of opening weekend. Peek below the fold for my thoughts on Legendary Star-Lord #1. I’ll start with the positive. This book is gorgeous. Paco Medina’s detailed pencil work is easily the high point of Legendar Star-Lord #1, and his efforts are strongly supported by the efforts of inker Juan Vlasco and colorist David Curiel. Together, those three produced some seriously vivid tableaus and several two-page spreads that had my chin on the floor. Sam Humphries script was okay too—it clearly runs parallel with the third volume of the Guardians of the Galaxy, and features some fun characterizations of some very naughty Badoon… but a somewhat less than compelling Peter Quill, in my opinion. Let me explain. First, I’m a big Star-Lord fan—especially Dan Abnett’s rendition of the character, which kicked off with the first Annihilation wave in 2006, during which Quill was a prisoner of the cosmic super prison the Kyln, and then went on to play a pivotal roll in overcoming the growing cosmic threat. That series gave way to Guardians of the Galaxy volume 2, which is the definitive edition of the modern Guardians (Guardians volume 1 being an entirely different, vastly stranger team… and that’s after you consider that the modern Guardians have a raccoon…). In Annihilation and Guardians volume 2, Quill was a crafty, charismatic, tactical genius. Intelligent, wily, sarcastic but never a punch line, Peter Quill was a very interesting character study, precisely because he wasn’t super and he wasn’t a joke. He had to live by his wits, like a space MacGuyver. All that began to change with Guardians volume 3. First, Quill’s hair color changed: from non-descript brown to surfer blonde. Then his personality began to shift, from wily tactician towards carousing ne’er-do-well, like a mash-up of Mal Reynolds, Han Solo, and the part of Captain Kirk who’s especially into green chicks… Which is great, don’t get me wrong. But it’s not the Star-Lord that I really started to dig during Abnett’s run. Now, fans of the Guardians might remember that certain events at the end of volume 2 left the fate of some members of team somewhat… up in the air. It was back to business as usual for the Guardians at the start of volume 3… or was it? We never did get resolution about what happen to Quill and the others, though there have been oblique promises from Marvel to address that in Legendary Star-Lord. As much as Marvel would like to attribute the changes to cosmic, time-and-space bending weirdness, I suspect something much more sinister than even Thanos could conjure: Marvel’s insistence on bringing the comics into alignment with the cinematic universe. It is obvious enough that Marvel is trying to bring the comic Quill’s appearance into alignment with Chris Pratt’s rendition—that much is clear from the cover. What’s eating at me is the insistence on changing the comic character’s personality to match. Now, don’t get me wrong: I adore Chris Pratt’s work, and The Avengers is the only Marvel movie I’ve anticipated nearly as much as Guardians of the Galaxy. 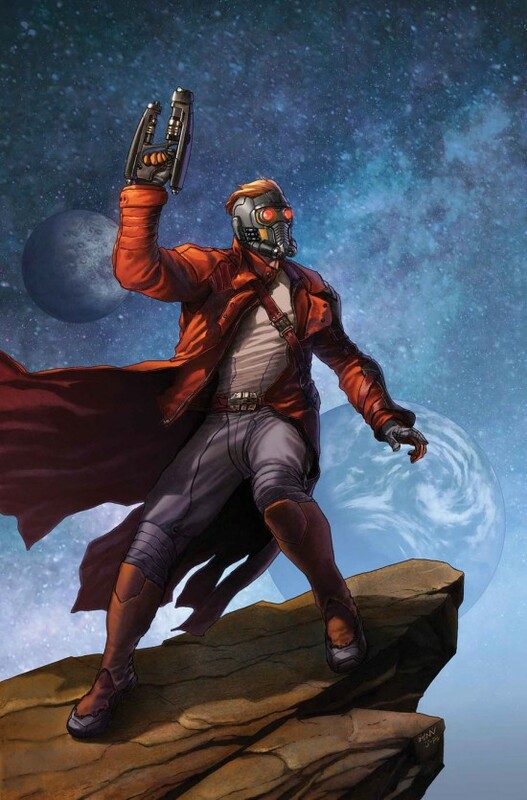 I’m greatly looking forward to Pratt’s interpretation of Star-Lord. I just feel like the film rendition doesn’t have to undo so much of the great work that came before it. Consider the “shocking twists” regarding Nick Fury in Original Sin #4 and #5. While cool from in some lights, they amount to a big, calculated move to bring the comic book Fury into alignment with the MCU. Of course, Marvel wants to meet the expectations of newly minted fans, which might leave the movie theater, cross the street, and walk into a comic store for the first time. But they shouldn’t do so at the expense of good characters and good stories, and the expectations of fans that have been dedicated to the Marvel cause for a long time. The comics and the movies don’t have to match perfectly, Marvel. There, I said it. So, what about Legendary Star-Lord #1? It was decent. Didn’t love it. Great art. Writing was fine, but it felt like Humphries didn’t have much editorial control. Legendary Star-Lord feels like part of a billion dollar agenda. Because it is.